This week feels totally different than last week. 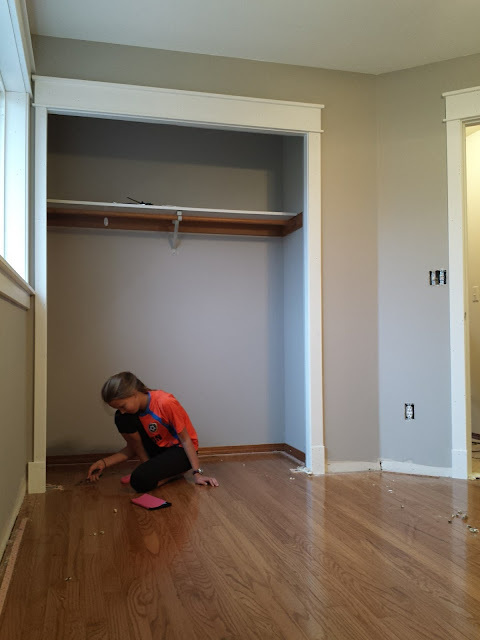 Last week we were scrambling to paint and replace trim, etc. in two of my kids rooms. My house was pretty much a mess and I was trying to get everything done enough to put the kids (and their stuff) back into their rooms before Grandma and Grandpa came to visit. We made it, but still have tons of trim touchup, caulking, etc. but the worst parts are done. I love how it looks. Yesterday was the quietest day that I've had in years. My whole family went with my inlaws to celebrate my husband's grandpa's 92nd birthday with him. I didn't go with them because we were having our first practice for our big children's presentation in church (that is in two weeks). So, I had the whole day all by myself. My house stayed clean. I didn't do any housework (since it was Sunday). I didn't have to make any food or do any dishes. It was very relaxing and quiet and nice to just be me. I was glad when my family came home though. We are lucky and get to have my father-in-law staying with us this week. We have our regular busy schedule, so I thought I'd better menu plan so we don't end up with oatmeal for dinner (although he'd be totally cool with that). All righty...that's my plan. What about you? What are you having this week for dinner? Feel free to share. I love it when you do. Need more dinner inspiration, check out all of my #379 weekly menus here.